Japan’s Prime Minister Shinzo Abe gave money to a controversial nationalist school, its head told parliament, amid an escalating political scandal. Yasunori Kagoike said the donation had been passed to him by Mr Abe’s wife, in testimony that contradicted Mr Abe’s repeated denials. The school is under fire both for its proposed curriculum and the low price it paid for state-owned land. The scandal has gripped the nation and hit Mr Abe’s approval ratings. Mr Kagoike’s testimony to parliament was broadcast live on several Japanese television networks. At the heart of the controversy is a primary school that he planned to build in Osaka, Japan’s second city. Mr Kagoike already runs a kindergarten that has come under scrutiny for drilling its young charges in pre-war nationalistic principles and patriotism. His organisation, Moritomo Gakuen, bought land to build a primary school run on a similar curriculum but Japanese media say he paid less than a sixth of the land’s value. Critics allege the government intervened to award the school a large discount. The government says the discount related to industrial waste found on the site. Mr Abe’s wife, Akie, was named as honorary principal of the school for several months before resigning in February. But the prime minister, regarded by many as a right-wing hawk with a revisionist view of Japan’s war history, has denied any role in the land deal and offered to resign if any proof emerged. 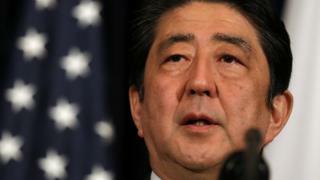 Mr Abe has also denied donating money to the school, though it would not have been illegal. Lawmakers summoned Mr Kagoike to parliament for questioning after he said last week he had received money from the prime minister via his wife in 2015. He told parliament he clearly remembered the occasion: “She asked her aide to step outside. “When it was just the two of us alone in the room, she said ‘This is from Shinzo Abe’ and gave me an envelope containing 1m yen [£7,200; $8,980) as a donation. Responding to the testimony, Chief Cabinet Secretary Yoshihide Suga rejected Mr Kagoike’s allegations: “Following our checks with Ms Akie [Abe], there are no records of any receipts, and Ms Akie herself has not made any donations. Mr Abe’s polling figures have fallen as the scandal has rumbled on. However, the most recent poll, in the Yomiuri newspaper, put support for him at a still-healthy 56%, down 10%.